Admiral Arthur W. Radford gave more than 45 years of distinguished military service to his country, spanning three wars - WW I, WW II, and the Korean Conflict. During that time he progressed from Naval Academy plebe to Chairman of the Joint Chiefs of Staff, the highest ranking position in the United States Armed Forces. Radford was born in Chicago, on February 27, 1896, and spent some of his earlier years in Iowa before receiving his appointment to the Naval Academy in 1912. Graduating from the Academy in 1916, he served aboard the battleship South Carolina as a "black shoe" during WW I until December 1918, after the signing of the Armistice. Assigned to staff duty, he managed to wangle orders to Pensacola in April 1920 for flight training - a dream he had had since early youth. Radford was designated Naval Aviator #2896 in November 1920 and from that point on he served the interests of Naval Aviation as a "brown shoe." Remaining in Pensacola until October 1921, he was assigned to the Flight Division of the newly established Bureau of Aeronautics in Washington, D.C. In November 1923, he finally got a chance to go to sea again with aviation units aboard the tender Aroostook and later the battleships Colorado and Pennsylvania. Shore duty followed at NAS San Diego from July 1927 until March 1929, when Radford left to head the Alaska Survey Detachment which made an aerial mapping survey of Southeast Alaska's forest and mineral resources. Joining Saratoga in November 1929, he served in various capacities aboard the carrier for three years. Following this Radford had another tour with the Bureau of Aeronautics and then went back to sea duty as navigator of the tender Wright in August 1935. In June 1937 he became C.O. of NAS Seattle, a post he occupied until May 1940 when he returned to sea for one year as X.O. of the aircraft carrier Yorktown. Radford's next assignment was a crucial one. In December 1941, he reported to the Bureau of Aeronautics less than one week before the attack on Pearl Harbor. He became Director of Aviation Training and during the first years of the war when America was struggling to gather together her military strength, Radford (then a captain) organized and managed the Naval Aviation training program. This program turned out thousands of skilled pilots needed to spearhead the offensive against the enemy. He had an eye for innovative solutions to problems such as safety and took on a reserve lieutenant, Robert Osborn, to illustrate safety posters and publications with Dilbert cartoons. 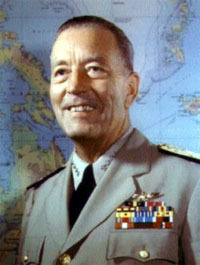 Radford left Washington in April 1943 to serve in the Pacific as commander of a carrier task group and then as Chief of Staff under Vice Admiral John H. Towers, Commander of Naval Air in the Pacific. His task group made repeated aerial assaults against the Japanese on Tarawa, the Gilbert islands and in other areas. With aggressive determination, Radford organized and trained at sea the first carrier-borne night fighter teams which later proved their effectiveness in breaking up hostile torpedo attacks. Returning to Washington in early 1944, he served as the Assistant Deputy Chief of Naval Operations (Air), helping to direct the Navy's Aeronautic Organization and the readiness of aviation units. He also had additional duty as alternate members of the Special Joint Chiefs of Staff Committee on the Reorganization of National Defense. At the end of the war Radford, again in Washington, D.C., was promoted to Vice Admiral and assumed duties as Deputy Chief of Naval Operations (Air). He assisted in planning the postwar Navy until February 1947 when he became Commander of the Second Task Fleet under Atlantic Fleet Command. Radford returned to the Navy Department in January 1948 as Vice Chief of Naval Operations and on April 2, 1949, he was appointed to the rank of Admiral. Later that month he was designated Commander in Chief, Pacific; Commander in Chief, Pacific Fleet; and High Commissioner, Trust Territory of the Pacific Islands. His responsibilities were increased tremendously when the Korean Conflict began in 1950. Two strategic areas, the Marianas.